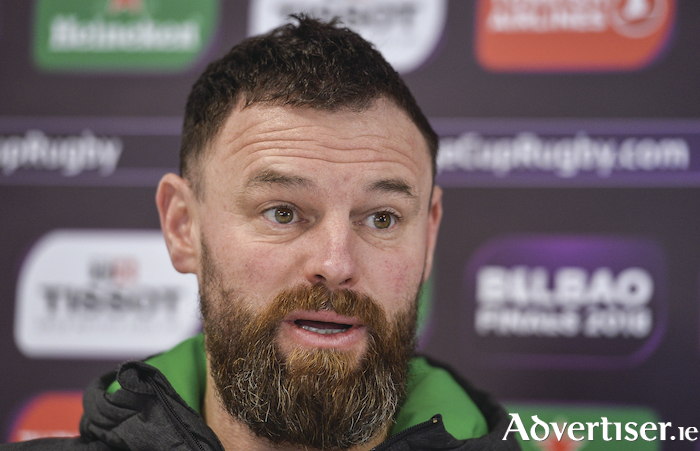 Connacht assistant coach Nigel Carolan is looking for his side to finish their challenge cup pool stage on a high. Photo: Sportsfile. Connacht host their final European pool fixture against French visitors Oyonnax on Saturday determined to finish with a flourish and nail down a home quarter-final. Expected to overcome Oyonnax with a bonus point, having produced a 43-15 win in Geneva in round one, Connacht are still not taking anything for granted in their bid to complete this series of games with a win. "Any time Connacht have been a little bit complacent at the start, we have suffered on the scoreboard," says backs coach Nigel Carolan. "Regardless of what team Oyonnax send over, we plan on producing a professional performance. "We are aware of the connotations, but if we go out there and believe we are going to be the Harlem Globetrotters, then I think we could be in for a tough day at the office." Connacht, currently ranked fourth with 21 points, are behind Edinburgh, who with 24 points are ahead of Pau on points difference, Newcastle with 23, while Gloucester, also on 21 points and second in their group, have a superior points differential of 37 over Connacht. Much, then, will be decided by the Gloucester v Pau tie in England, while Newcastle head to Tblisi to face Russian side Enisei-STM, and Edinburgh face Stade Francais in Paris. "We know Oyonnax are a physical outfit, they have serious players, and whatever side they send over, whether frontline or second, they are still registered players, and we have to deal with everything they throw at us," says Carolan. "We have a good record at home and we are looking foward to playing in front of a noisy crowd and our guys get a real kick from it - the last game was Ulster and that ended positively, and before that Brive, which was a polished performance, and we expect that again on Saturday. Certainly we are going to go at it from the start. "We want to finish this block of games on a real strong note so that we can prove to ourselves there is a level of consistency in the group. After the minor adversity last week when we had a poor start, and down to 13 players, it showed there is a real character and fight in these players. They want to finish this block on a high, and while the result may not affect the quarter-final standings too much, it is important for ourselves." International players are available, and are expected to feature, including Bundee Aki, who suffered a quad haematoma against Worcester. Prop Finlay Bealham is unavailable for a possible three weeks after it was confirmed he suffered a knee injury in training last week, while openside Jarrad Butler has fractured a bone in his hand and is ruled out for up to a month. Thin in the back row, Carolan says the break is timely with both Sean O'Brien and Eoin McKeon due back early next month. "Our international players have been managed and so this week we have a full deck available. It is important we do not disrespect this game and put out a young side who could get involved in a tussle. We are here to do some business and go about it in a professional way." Connacht will certainly be looking for a better start than they produced against Worcester, behind by 12-0 after just five minutes at Sixways Stadium on Saturday. They "couldn't have come out faster backwards" said coach Kieran Keane, after his side were still down by 10 at half time. However they took control of the second half, never conceded a point, and wrapped up leadership of the pool. The only negative was their failure to put their hosts away in the final minutes when they had the chance. "Disappointed not to nail it at the end, we had the opportunity," said Keane. "We dug a hole for ourselves, buried ourselves halfway up to the shoulders and then came out of it with a little bit of class. Pretty chuffed with how we finished, but disappointed we couldn't actually put the nail in the coffin. "The big issue is about how we dig these holes for ourselves and we are pretty good at it. We've had a few honesty sessions and a lot of debate, but the time for chat is probably over. We just have to get things right otherwise we make it too tough and will probably lose."